About one in five people in the developed world suffer from allergies at one point or another in their life. Scientists do not know why your body over reacts to certain allergens. Allergies can be genetic. However, researchers have also linked environmental factors with allergies. The symptoms of allergies can range from itchy, watery eyes, to sneezing or post nasal drip. You may get a rash, or even hives. Symptoms vary depending on what is causing your allergy. They can also mimic symptoms of the common cold. So how can you tell what is making you miserable? You will need to see a doctor who will record your complete medical history. Your doctor may recommend an allergy test to evaluate your condition. The most popular allergy test is called the prick method. A drop of a possible allergen extract will be placed on your skin. A small needle is used to poke through the extract so it enters into the skin. The skin will swell at that site if you react to that specific allergen. Usually, your doctor will test various possible allergens at once. Another skin allergy test is called an intradermal test. In this case, the doctor injects the allergen extract with a syringe. They usually do this on the upper arm. Again, they can test many different allergens at once. If you are allergic to any of the extracts, you will develop a hive. 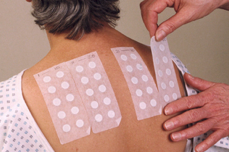 Contact dermatitis is usually diagnosed with a patch allergy test. In this case, your doctor will put some of the suspect substance on your skin, and cover it for a couple of days. Your skin will turn red and start to peel if you are indeed allergic to the substance. 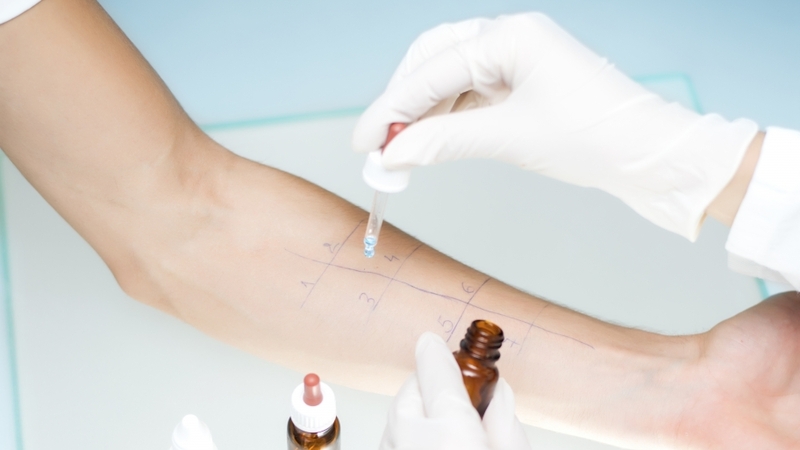 People with skin conditions such as eczema may not be good candidates for a skin allergy test. A radioallergosorbent test or RAST may also be used to diagnose your allergies. This is a blood test. You will have a sample of blood taken. It will then be studied for the antibody to a certain allergen. Once you have the results of your allergy test, your doctor may recommend allergy shots. This is a process that involves slowly introducing the allergens to your body. As you become used to a certain level of irritant, the level of allergen extract will be increased. Some people will need to undergo allergy immunotherapy every week for several years to desensitize themselves to certain allergens. Other people may need allergy shots only during hay fever season. Sometimes you can use a process of trial and error to discover what you are allergic to. You should take note of your allergy symptoms. Write down when it occurred, where you were and what you were doing at the time. See if you can avoid an allergic reaction by avoiding similar circumstances. This also works well if you have food allergies. Once you determine what is causing the problem, you can avoid that food. That means reading and understanding food labels. Dust, pollen, pet dander and mold allergies require some special attention. You should avoid the outdoors when there are high pollen counts, and close your windows. An air conditioner will help filter the indoor air. You should also clean, vacuum and steam clean all surfaces rugs and furniture to keep the levels of possible allergens down. When you can’t eliminate the things you are allergic to, you may need to try allergy medication. Medications can include antihistamines which block the action of histamine. Histamine leads to allergy symptoms. However, these drugs can cause drowsiness. Most antihistamines are available without a prescription. Can Allergen Immunotherapy Help Reduce Allergic Response to Pollen and Bee Stings?